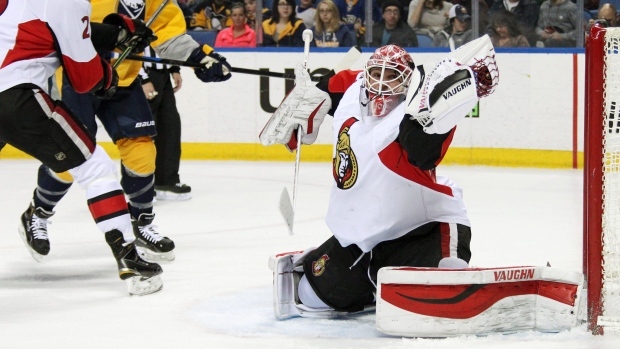 FORT LAUDERDALE, Fla. - By trading Robin Lehner to the Buffalo Sabres, the Ottawa Senators solved their crowded-crease problem, shed a contract and picked up another first-round pick in the NHL draft. The Senators got the 21st pick Friday night for Lehner and centre David Legwand in the first big deal of the weekend. General manager Bryan Murray held out for the first-rounder and could be satisfied about the return for the sought-after 23-year-old goaltender. "We think Robin's going to be a good goaltender in the league," Murray said Friday afternoon. "Surely the preference would've been to send him elsewhere other than in our own division, we know that. "But that was the best deal, and it was a deal that I ended up making as a result." Dealing Lehner or Craig Anderson became a necessity after Andrew Hammond's unbelievable second-half success. Once the "Hamburglar" had a new contract, Murray knew he had to deal one of his other goalies, and Lehner ultimately attracted more interest than Anderson. Murray said several teams wanted Lehner, one of a handful of goalies available, but no one until nephew Tim Murray of the Sabres was willing to part with a first-round pick. Tim Murray scouted and drafted Lehner when he worked for Ottawa, and that made the difference. Buffalo, which is getting Jack Eichel second overall, didn't mind parting with the 21st pick even after sending what turned out to be the 25th selection to the Winnipeg Jets in the Evander Kane trade. Tim Murray felt like he won the draft before it even started. "If you had've told me that the last day we had the three (picks) before the Kane trade that on this day we were getting Eichel, Kane and Lehner, I would have said, 'You're on mushrooms,'" he said. "I would have said, 'There's no way that's going to happen.' "
In Lehner, the Sabres get a player Ottawa assistant GM Pierre Dorion said "has the upside to be one of the top five goalies in the league." Lehner went 9-12-3 with a 3.02 goals-against average and .905 save percentage last season before suffering a concussion. In 86 career NHL games, the Swede has a 2.88 GAA and .914 save percentage. The Senators will go with the tandem of Anderson and Hammond, and should now have room in the budget to sign restricted free agents Alex Chiasson and Mike Hoffman with Legwand's US$3.5-million salary off the books. Murray said trading a contract had to be part of the deal, and he'll still look to move forward Colin Greening this off-season. Dealing Lehner was a good start for the Senators, who have playoff aspirations again after this past season's improbable run. "The result probably won't be known for a few years, both with Robin's performance and what we acquired in the draft," Murray said. After selecting Saint John Sea Dogs defenceman Thomas Chabot with their pick at No. 18, the Senators used the 21st acquired for Lehner to take centre Colin White from the U.S. National Team Development Program. White's progress at Boston College next season and beyond will be tracked alongside Lehner's. "I try not to think too much about that," White said. "I try to keep it to myself." Lehner was the Sabres' target all along because Tim Murray knew him so well. "He was the No. 1 goalie available from our estimation," Murray said. "I think he's a very talented, big strong, man that is just scratching the surface."